Posted on October 10, 2018 at 1:13 am. Homeowners in Irving, TX are tasked with a lot of things to keep their house energy-efficient and comfortable this fall. While they concentrate more on major concerns like repair or unit replacement, they do not realize that even the simplest things like leaving their vents open can cause a significant impact on their overall comfort and on how their HVAC system works. To keep your system running efficiently, make sure to do the right thing. 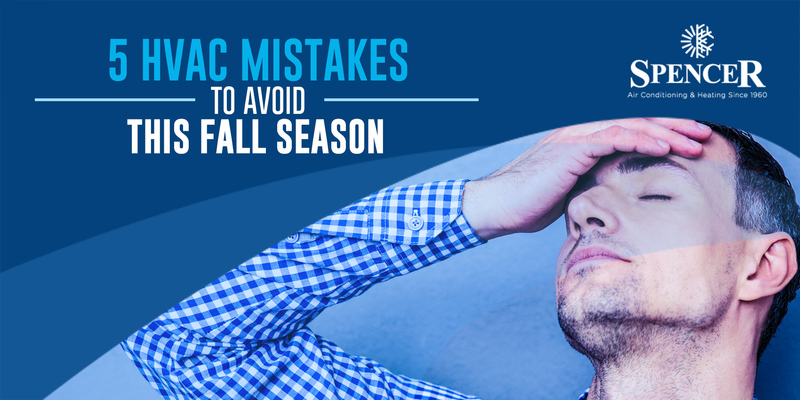 Here are the HVAC mistakes you should avoid this fall season. Sometimes, all you need is to close the vents in unused rooms to achieve the right level of heating in the areas where you need warm air the most. Also, make sure to check for rugs on the topmost part of your vents or remove the furniture that blocks your heating unit. Most often, inefficient heating occurs due to damaged ductwork. Your unit has to work double to provide the same level of heating indoors. So, before the cold season steps in, make sure to inspect your ducts to spot the leaks. Get these leaks sealed using the sealing tapes or sprays. Also, clean your duct to get the hot air going to the right point. The rule of thumb says: when the temperature outside changes, your indoor temperature should also change with it, thus requiring you to adjust the thermostat settings. A failure to follow this guideline can lead to higher energy bills and discomfort indoors. It will not take much time for your air filter to get filthy. Air contaminants that cause allergy and skin irritation due to dirty air filter can attack you and your family when you are off guard. So changing it as necessary as possible is a wise move to get the quality of your indoor air better. You can never question why fall HVAC maintenance is necessary to get your system efficiently running and to extend the lifespan of your unit. With regular maintenance, almost all repair calls can be avoided, helping you save cash in the long run. By neglecting the routine check, you are costing yourself time, money and comfort. This fall, make sure to eliminate small issues before you lose count of them and become major problems. Engage in a fall HVAC maintenance and get your system ready for the cold season. Have you noticed problems in your HVAC system in Irving, TX? Call Spencer Air Conditioning & Heating immediately!